We celebrated Dora the Explorer's birthday at Walmart yesterday by eating some yummy birthday cupcakes. Today, Nickelodeon is airing a special birthday episode of Dora and everyone can celebrate her big day -- she's 10! The episode airs at 8PM ET. Before this year I guess I never questioned Dora's age. Her character has been an ongoing favorite of both my son and daughter. In my kids' minds, she has always existed. Dora clothes, Dora backpack, Dora DUPLO -- we own plenty of Dora merchandise that I purchased mostly at garage sales. The kids love pretending to explore along with Dora and they really like to make up their own pretend Dora adventures. 1st Brimful home episode - "Dora and the bath mat" - My mother-in-law stays with us from time to time. Once, when my daughter was a toddler, she took a shower, removed the plain suction cup bath mat and lightly placed the map with the suction cups facing up so the bath mat could dry out. Neither my husband or I realized that the bathmat was the wrong way and we tried to place my daughter on it for a bath. My daughter screamed and screamed after touching the strange suction cups and refused to go near the tub after this unfortunate incident. Luckily, after a little while and thanks to a new and fancy Dora bath mat, we finally coaxed her into the tub. 2nd Brimful home episode - "Dora and the hospital visit" - Late one night this past spring, my toddler son woke up crying and frantically pulling at his PJs. I turned his bedroom light on, took off his sleeper and it shocked me when I discovered that his entire body was swollen, red and covered in hives. I freaked out a little, called the nurse on call and ended up taking him to the hospital. For some reason Dora popped into my mind on the trip there (probably because I was overly tired and delirious). Anyway, to calm my son and myself, I made up a little Dora game. I told him we were on an adventure like Dora. First we passed the starry sky, then drove up to the big building and finally visited the doctor so that he could help solve the hives mystery. Amazingly, my son breezed through all the tests without becoming upset and even enjoyed the pretend Dora game. I let the nurses in on the secret and they played along, too. We never found out what caused the hives, but I'll always remember the part Dora played in helping to keep both of us calm. 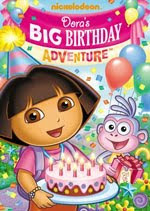 A new Dora DVD titled Dora's Big Birthday Adventure (released August 03, 2010) contains the birthday episode that will be on TV tonight along with two other episodes. All three episodes feature the Wizzles and Wizzle World and form the Magic Storybook Trilogy. "Dora's Big Birthday Adventure" - Dora is preparing to celebrate her birthday with her friends and family but a twisting wind blows Dora and Boots into the Magic Storybook and the Wizzle World. Dora ends up with a wishing crystal and must take it to the Wishing Wizzle before she can return home. Hmm, sounds a little familiar...what follows is a plot relatively similar to The Wizard of Oz. There's a mean witch (La Bruja) with flying monkey helpers, a nice Snow Princess, a star studded road, and even a scarecrow. To find to the Wishing Wizzle Dora must first find her way through Sea Snake Lake, The Dancing Forest and go over the RAINBOW. Along the way she looks into the wishing crystal and her memories of her family and friends (shown as hazy flash backs to previous episodes) help propel her over the obstacles. My children especially enjoyed the birthday celebration at the end of the show. "Dora Helps the Birthday Wizzle" - In this episode about birthday wishes, the Birthday Wizzle is celebrating his own birthday. As he prepares to make his own birthday wish come true, a strong wind blows his wishing wand out of the storybook. Dora catches and works to return the wand to the Birthday Wizzle before the candles on his cake burn out. She goes through the Unicorn Forest and Dinosaur Caves and ends up on Wizzle Mountain. There's a Birthday Express train in this episode that appealed to my toddler son. "Wizzle Wishes" - A little Wizzle happily holds a bag of four wishing stars, but a strong wind blows the wishes right out of his bag and the storybook. He follows them out of the book, and Dora helps him try to capture the wishing stars so that he can wish his way back home. They follow the path through a flowery garden and nutty forest all the way to the wishing well. The new birthday episode is enjoyable to watch because it includes all the characters from previous Dora episodes. My daughter was happy to see the Piggies. The DVD cover we received includes a big pop up flap and a sticker sheet so that kids can actively join in the birthday fun. My kids also enjoyed counting the ten candles on the cake displayed on the cover. The Nickelodeon website contains even more Dora birthday activities, games and printables including a Dora Wishing Crystal Necklace, Dora Forest Puppet Theater and even a Big Birthday Adventure Game. "Lost Map"; "Hide and Go Seek"; "Journey to the Purple Planet"; "Rescue, Rescue, Rescue! "; "Star Catcher"; "Star Mountain"; Boots to the Rescue"; "Swiper the Explorer"
Offering the most bang for your buck, this DVD features 198 minutes of Dora episodes. Favorite episode here is "Journey to the Purple Planet" with the aliens and the spaceship. "Mixed Up Seasons"; "To the South Pole"; "Save Diego" and "Beaches"
Dora the Explorer – "Bugga Bugga"; Go, Diego, Go! – "Manatee’s Mermaid Rescue! "; The Wonder Pets! – "Save the Tree" / "Save the Elephant"; Yo Gabba Gabba! – "Green"; Blue’s Clues – "What Does Blue Want to Make out of Recycled Things? "; Ni Hao, Kai-lan – "The Place Where We All Live"
The Dora "Bugga Bugga" (from Season 1) isn't a favorite here, but my kids did go a little ga-ga over the Yo Gabba Gabba! episode about taking care of flowers, plans and animals. Dora the Explorer – "First Day of School"; Go, Diego, Go! – "Linda the Librarian"; Blue’s Clues: "Blues Takes You to School"; Wonder Pets – "Off to School" / "Save the Pangaroo"; Ni Hao, Kai-Lan – "Lulu Day"
The Dora "First Day of School" episode is from Season 5 in the television series. Dora accompanies Tico and Boots on an adventure as they travel to school. Dora the Explorer - "Boo! "; Go Diego, Go! - "Freddie the Fruit Bat Saves Halloween! "; Wonder Pets! - "Save the Bat" / "Save the Acting Donkey"; Yo Gabba Gabba - "Halloween"; Blue's Clues - "What is Blue Afraid of? "; Ni Hao, Kai-lan – "Ni Hao, Halloween"
I don't understand what the appeal is (maybe the dressing up aspect or maybe the candy? ), but my kids can watch Halloween themed DVDs all year round. When I asked my daughter to pick her favorite DVD from this post, this is the one she chose! It runs 149 spooky minutes. Loved your Dora anecdotes--how wonderful that you were able to keep your son happy with his very own "Dora" adventure!